The brand new main dock is within walking distance of town (0.3 km). Or if you have mobility issues, you can take a little road-train to get there, an expensive 15 Euro per person. On the rare occasion when two ships are docked one will be located across the inlet. Printable map to take along. The red dots represent a suggested walking tour. Every year thousands of tourists visit the local coastal area, enjoying its fjords and thousands of small islands. The Kristiansand area has more days of sunshine than any other location in Scandinavia, and the beaches and smooth rocks are ideal for sunbathing. The area is considered being the number one holiday area in Norway. By charter boats tourists can visit the unique scenery and the charming fishing villages with their traditional white wooden houses. Salmon fishing is popular at the river that runs through the city. At the Fisherman's wharf one can find an exciting fish market, lively restaurants, small boat traffic and sight-seeing boats. Since the renaissance town was founded in 1641, Kristiansand has boasted one of the world largest fleets of sailing ships until the beginning of the last century. Often being the first Cruise Port for ships arriving from Europe. Today, the city serves as the primary hub for ferry, shipping, air, road and rail traffic in southern Norway. Posebyen is what's left of Kristiansand's old town. It still occupies several blocks on the eastern part of the town center. Here you can still see small, white, single-storey, wooden houses occupy a whole block. Very peaceful just a few minutes' walk from the busy shopping streets. Ravnedalen (Ravens' Valley) is a lovely park just outside the city center. It is surrounded with steep cliffs and presents the visitor with lush flower gardens and manicured laws perfect for picnics. If you forgot your picnic basket, there's also a café here. There are sometimes music performances in the summer. The Odderøya peninsula (just to the right if you walk off the cruise pier) is a former military area that has been converted into a recreational park a few years ago. It makes for pleasant and quiet nature strolls, with views across town or across the sea. The town's center is quite compact, which means that everything is within walking distance. 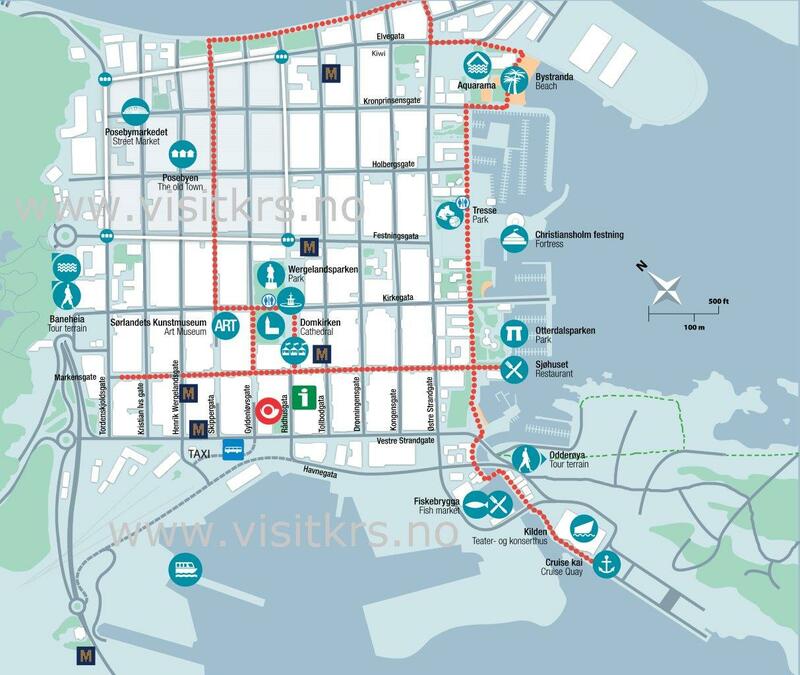 A great way to see Kristiansand is on foot. A nice and economical trip to take is to the charming waterside village of Lillesand by bus. The bus station is a 10 minute walk from the ship. Take the number 5 bus from bay 7 at the bus station. The service, in both directions, is half-hourly and buses leave the bus station at 15 and 45 minutes past the hour, and adherence to the published timetables is very good. The journey to Lillesand takes about 45 minutes, and you can ask the driver to let you know the best stop to get off, from where it is a 700 meter stroll downhill to the waterside, Seniors travel at half the standard fares, so Kristiansand to Lillesand for seniors is NOK 42 each way. The Setesdalsbanen Vintage Railway - Narrowgauge (1067mm) railway powered by a steam engine from 1901. The track section covers 8km through tunnels, under avalanche shelters and across dams. The trip recreates the special atmosphere of a turn-of-century railway journey. A traditional light snack, lefse, can be offered in authentic historical surroundings. Please note the Setesdalsbanen Railway runs on Sundays only for independent visitors. For cruise passengers the railway is chartered by the ship and it is not possible to do independently. Dyrepark, It is a zoo with huge open exhibits for the animals. The park itself is very large and is like a very nice hike in the woods. Simply walk into town and take the M1 or 01 bus to Dyrepark Quality Inn stop - it's a 30 minute bus ride and costs 38 NOK each way. The service runs every 15 minutes. Odderøya – the main cruise harbor is on the island of Odderøya. It is a great place for hiking any day of the week, on Sundays the community of artists on the island open up their galleries and there are cafes on the island. Markens gate is the main shopping street in the town center. Most of the street is pedestrianized. Most of the shops are now chain stores, but it is still a busy and nice main shopping street. A few independent stores are still here. It's a central gathering place for most locals, and thus more than a shopping street. In addition to Markens gate is also Skippergata which has more smaller, independent shops and boutiques. ATMs in Norway are called Minibank. In Norway Chip&PIN is the norm now, so needing some form of picture ID when paying by card is rarely required. The port is also offering free WiFi to guests and crew. At the Tourist Information office in Kristiansand there is free WiFi. The closest WiFi to the main cruise harbor is at Kilden, the performing arts center. Passengers are encouraged to buy a coffee / beer / etc and then they can use the WiFi.